Difference between revisions of "Brickade"
The [[HVY]] '''Brickade''' (internally named '''Avan''') is an armored van in [[The Ballad of Gay Tony]]. The van is notable in the game for being normally inaccessible in gameplay, and as a result, can only be accessed via modding, hacking or specialized savegames. The [[HVY]] '''Brickade''' (internally named '''Avan''', likely an abbreviation of '''a'''rmored '''van''') is an armored van in [[The Ballad of Gay Tony]]. The van is notable in the game for being normally inaccessible in gameplay, and as a result, can only be accessed via modding, hacking or specialized savegames. It is unknown why the Brickade is not used in the game. It is unknown why the Brickade is not used in any mission in the game. The Brickade is roughly based on a [http://www.flickr.com/photos/daveyhoppers/2949082877/ Prosegur armored car], similar to the [[Securicar]] (which interestingly bear a similar "Stockade" badge), but adopts a cab-over design, a beige bodywork and much smaller wheels. In addition to a thick body shell, the Brickade is also equipped with plating that protects the front radiator grill, as well as steel mesh grating covering the front windscreen and wheel wells (which does not actually protect the Brickade's tires from gunfire). Despite it having two doors in the front and two doors in the back like the Stockades (including the [[Securicar]]'s relatives, the [[Enforcer]] and [[Police Stockade]]), it can only fit two people in it as the back doors are not programed to open and fit people in the back similar to the Stockade models, and will only open after the vehicle is heavily damaged. Although it bears no badging, police chatter implies the Brickade is manufactured by [[HVY]]. The Brickade also lacks turn signals and reverse lights. 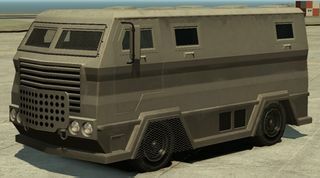 The Brickade appears as a large but stumpy and generic [[wp:Armoured bus|armored bus-like]] van, similar to the [[Securicar]] (which interestingly bears a similar "Stockade" badge), but adopts a cab-over design, a beige bodywork and much smaller wheels. In addition to a thick body shell, the Brickade is also equipped with plating that protects the front radiator grill, as well as steel mesh grating covering the front windscreen and wheel wells (which does not actually protect the Brickade's tires from gunfire). The Brickade is implied to be associated with the [[LCPD in GTA IV Era|police]], as it has a [[Police Radio|police radio]] and the ability to pass through [[tollbooths]] without paying. However, unlike most police vehicles, the Brickade can use a [[Pay 'n' Spray]]. Although it bears no badging, police chatter implies the Brickade is manufactured by [[HVY]]. Given its armored construction and subsequently heavy weight, the Brickade's performance is poor but is fairly hardy, as expected for a vehicle of its class. The Brickade suffers from poor speed on average due to poor acceleration, but can reach slightly above average top speeds after uninterrupted and prolonged acceleration. Its steering also varies; due to its shorter wheelbase, strong torque and rear wheel drive, the van can execute tight turns at low speeds, but this trait is hampered as the vehicle travels faster and increases its inertia. Similarly, its brakes are reliable when the vehicle travels slower, but requires a moderately longer stopping distance when braking in higher speed (although they still fare better than those of the [[Ripley]]). Regardless, the Brickade's heavy weight allows it to push smaller and lighter vehicles out of the way with ease. Given its armored construction and subsequently heavy weight, the Brickade's performance is as expected for a vehicle of its class. The Brickade suffers from poor speed on average due to poor acceleration, but can reach slightly above average top speeds after uninterrupted and prolonged acceleration. Its steering also varies; due to its shorter wheelbase, strong torque and rear wheel drive, the van can execute tight turns in low speeds, but this trait is hampered as the vehicle travels in higher speeds and increases its inertia. Similarly, its brakes are reliable when the vehicle travels slower, but requires a moderately longer stopping distance when braking in higher speed (although they still fare better than those of the [[Ripley]]). Regardless, the Brickade's heavy weight allows it to push smaller and lighter vehicles out of the way with ease. The Brickade is also considerably hardened to handle selected forms of damage to an extent, to the same degree as the [[Enforcer]], [[Police Stockade]] and [[Securicar]]. The vehicle can absorb large amounts of gunfire, but will eventually succumb to engine damage, especially when it is shot at its weakest point in the front, where the engine is, and after excessive frontal collisions. The Brickade can also survive six direct hits from [[Explosive Shotgun|explosive shotgun rounds]] at any part of the vehicle (three times the amount of a regular car) before its gas tank ignites and results in the vehicle exploding. The Brickade is also considerably hardened to handle selected forms of damage to an extent, to the same degree as the [[Enforcer]], [[Police Stockade]] and [[Securicar]]. The vehicle can absorb large amounts of gunfire, but will eventually succumb to engine damage, especially when it is shot at at its weakest point in the front, where the engine is. The Brickade can also survive six direct hits from [[Explosive Shotgun|explosive shotgun rounds]] (at any part of the vehicle) before its gas tank ignites and results in the vehicle exploding (three times the amount of a regular car). * The Brickade shares the same engine sound and interior with the [[Ripley]]. * The Brickade shares the same interior with the [[Ripley]]. * Despite featuring a meshed frontal windscreen, the player can still be thrown through the Brickade's windscreen in a high-speed collision. * When exploded after suffering heavy damage, the actual bodywork of the Brickade is only slightly charred (although generic parts, such as its wheels, lights and interior are severely burnt), unlike other vehicles in GTA IV games. * When exploded after suffering heavy damage, the actual bodywork of the Brickade is only slightly charred (although generic parts, such as its wheels, lights and interior are severely burnt), unlike other vehicles in GTA IV. * The Brickade is the most durable front engined vehicle in [[GTA IV Era|GTA IV series of games]]. *[http://www.youtube.com/watch?v=q9e8mkKlD9U Depiction of the Brickade by GTASeriesVideos] on YouTube. *[http://www.youtube.com/watch?v=rCnukBVH1DA Depiction of the Brickade by GTASeriesVideos] on YouTube. A Brickade in The Ballad of Gay Tony (Rear quarter view). The HVY Brickade (internally named Avan, likely an abbreviation of armored van) is an armored van in The Ballad of Gay Tony. The van is notable in the game for being normally inaccessible in gameplay, and as a result, can only be accessed via modding, hacking or specialized savegames. The Brickade is roughly based on a Prosegur armored car, similar to the Securicar (which interestingly bear a similar "Stockade" badge), but adopts a cab-over design, a beige bodywork and much smaller wheels. In addition to a thick body shell, the Brickade is also equipped with plating that protects the front radiator grill, as well as steel mesh grating covering the front windscreen and wheel wells (which does not actually protect the Brickade's tires from gunfire). Despite it having two doors in the front and two doors in the back like the Stockades (including the Securicar's relatives, the Enforcer and Police Stockade), it can only fit two people in it as the back doors are not programed to open and fit people in the back similar to the Stockade models, and will only open after the vehicle is heavily damaged. Although it bears no badging, police chatter implies the Brickade is manufactured by HVY. The Brickade also lacks turn signals and reverse lights. The Brickade is implied to be associated with the police, as it has a police radio and the ability to pass through tollbooths without paying. However, unlike most police vehicles, the Brickade can use a Pay 'n' Spray. The Brickade suffers from poor speed on average due to poor acceleration, but can reach slightly above average top speeds after uninterrupted and prolonged acceleration. Its steering also varies; due to its shorter wheelbase, strong torque and rear wheel drive, the van can execute tight turns at low speeds, but this trait is hampered as the vehicle travels faster and increases its inertia. Similarly, its brakes are reliable when the vehicle travels slower, but requires a moderately longer stopping distance when braking in higher speed (although they still fare better than those of the Ripley). Regardless, the Brickade's heavy weight allows it to push smaller and lighter vehicles out of the way with ease. The Brickade is also considerably hardened to handle selected forms of damage to an extent, to the same degree as the Enforcer, Police Stockade and Securicar. The vehicle can absorb large amounts of gunfire, but will eventually succumb to engine damage, especially when it is shot at its weakest point in the front, where the engine is, and after excessive frontal collisions. The Brickade can also survive six direct hits from explosive shotgun rounds at any part of the vehicle (three times the amount of a regular car) before its gas tank ignites and results in the vehicle exploding. The Brickade shares the same interior with the Ripley. Despite featuring a meshed frontal windscreen, the player can still be thrown through the Brickade's windscreen in a high-speed collision. When exploded after suffering heavy damage, the actual bodywork of the Brickade is only slightly charred (although generic parts, such as its wheels, lights and interior are severely burnt), unlike other vehicles in GTA IV. The Brickade is the most durable front engined vehicle in GTA IV series of games. Depiction of the Brickade by GTASeriesVideos on YouTube. This page was last modified on 16 April 2012, at 20:17.